If you don’t see your question answered here please call us. Heck, even if your question is answered, all events are unique, call us to talk about your special event. What does the 1000 Words Photo Booth look like? Can I choose the color of the photo booth kiosk? It would be so great to have a live slideshow of the pictures, is that possible? What can you tell me about the prints? Do you travel outside of your listed locations? Who are some vendors that you enjoy working with? How much time and space do you need for setup? What do customers love about the 1000 Words Photo Booth? 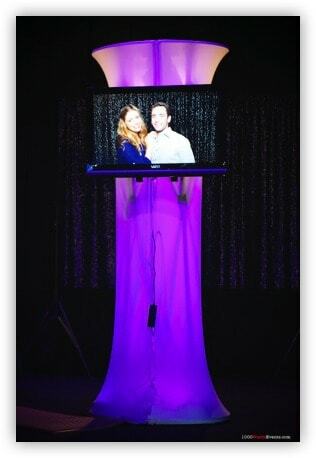 The 1000 Words Photo Booth centerpiece is a sheer hourglass kiosk lit with a color to match your event. The backdrop (chosen ahead of time by you) is set up prior to the event. A discreet operator’s table with computer is set nearby to manage the show. Can I choose the color of the photo booth? Yes, the hourglass kiosk will be lit with a color to match your event. You can choose from any color in the rainbow! The photo booth and screens are setup to make the most of the atmosphere at your event! Your guests will enter our perfectly lit open-air photo booth to shoot their own self-portrait. With our professional studio lighting, you and your guests will look fantastic! Moments later, our team will provide everyone in the photo a customized photo strip as a party favor. The photos are quickly previewed and uploaded into a slideshow that continues to grow and change throughout the event. The photos can be shown on one or multiple screens for your guests to enjoy. You choose from several backdrops; crushed red velvet, elegant black, green screen or we’ll work with you to choose a specific color/texture or green screen. Check out all of our options on our Backdrop page. Since every event is unique, the best way to get an idea is to call or email us and we will give you a customized quote. What can you tell me about the printouts? Our photo printers churn out beautiful custom prints. Many people choose the “old-time photo booth” style with pictures 3-up on a vertical strip, but we offer several choices along with options to print photo buttons, larger prints, key chains and more. Who are some vendors you enjoy working with?